Testimonials - Getting transcripts made fast and simple, just like that! Loading Facebook plugin for testimonials. This may take a few seconds. 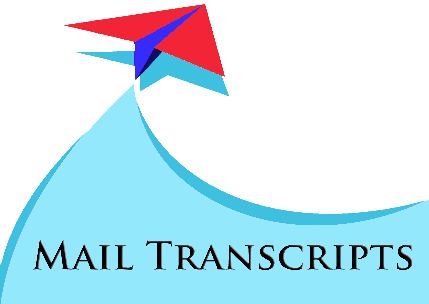 Mail transcripts team is one of the best service provider institution. The work was done before the estimated time. Very professional and promising team. I really appreciate the work and I thank you to the supporting staff of the mail transcripts team. I recommend mail transcripts. The service fees is also reasonable. Thank you dear mail transcripts . Firstly, thank you for the prompt and on-time delivery of my courier, and apologies for the delay in responding to your email. I'm delighted that you could complete the procedures and deliver my transcripts more than 10 days before the scheduled date as estimated during the application. I am indeed very thankful to you for the excellent and completely hassle-free service provided throughout. I've had no issues of concern with you whatsoever at any time. I will definitely use your services in the future for any similar requirement, and also recommend you to friends and family. Wish you the best. This is amazing service. I am so impressed. Thank you so much. I couldn't believe it was sent on 16th, its crazy. my ETA was 22nd. The quality of service I got was great in all aspects , starting from answering my queries on FB chat late night and queries on phone, status check and email updates to delivering my order before time. You guys literally lived up to your motto "Getting transcripts made fast and simple, just like that!" I am so glad and happy that an establishment/ service like yours even exists which is so helpful. I was very upset and had no idea how I was gonna get the transcripts from the university, the time and energy required was something I didn't have, then I read about you guys and it felt like this is God sent. It was fast and simple for me. Thanks! Mail Transcripts is excellent, prompt and proactive. I could not have asked for a better company to complete the process of collecting my transcripts from the University of Mumbai. Their personalized approach and focus helped me get my transcripts in a record time. i would totally recommend their services for people looking to getting their sealed official transcripts. Excellent excellent excellent!! Especially a big thanx to Shivam Agarwal who was always available to take my calls and address all my doubts and queries. Time is precious and what better than someone going through a tedious and time consuming process for you which lets you concentrate on the other tasks in hand. Being a working professional, going and doing rounds of Universities and Institutes is the last thing I wanted to spend time on. This is where MailTranscripts came in and did the job without me having to break a sweat. Just a few scans and a courier and the transcript are delivered at your home. A special mention to Shivam, who always be available for helping and keeping you informed about the status. I've received my transcripts today. Thank you and I really appreciate the quick turnaround time. I'm surely going to recommend MailTranscripts to those of my friends who are looking for similar services. Getting Indian transcripts from overseas is a daunting task and you guys are doing a great job by making this significantly convenient for people like us. Keep up the good work. You guys rock !! I wanted to apply for ECA in WES.org and needed sealed transcripts for the same. But my college and my current stay is in different cities. Mailtranscripts is the solution. They are so fast and professional. I had tried some oter service earlier, but MailTranscripts is the BEST. I would recommend it to anyone . I am very happy with your promptness and service. I would really appreciate if you could arrange my Utkal transcripts for me. Let me know if you need any help to finding a contact . This is awesome and service is faster than expected thanks a lot good job for the entire team. Great job, easy andquuick. Thank you. The service is great. I had applied for my MS in the US, and after checking out many services that sent the transcripts, decided on this one. I am glad I did, they have done an excellent job. They sent me updates at every stage and also responded fairly quickly to all my queries. The university has received my transcripts and have confirmed the application. Will gladly recommend. The services offered by MailTranscripts is amazing! I was clueless how to apply for getting transcripts from the West Bengal University for my wife since we stay in Mumbai. But thanks to this wonderful team, they got it done within 2 months from application. Highly recommended and trustworthy! Thanks you so so much mail trancript team. It was so hassle free and within matter of couple of weeks I had my transcript sent to my address outside India. I am really thankful to the professional team and will be my go to firm for any such requests in future. Thank you so much to the mail transcript team. Everyone was very helpful , reliable and courteous. They always kept me updated with the latest changes. I received the transcipts without any hassle and will recommend anyone to use their services. Thank you to the team of mail transcripts. I'm very impressed with their service.I received my transcripts in just a week!! It is a fast, reliable, hassle free and a lot more easier way to get the transcripts. I highly recommend it to those who are looking forward to get the transcripts from their university. Many Thanks to MAIL TRANSCRIPTS as without a hassle my graduatoin sealed transcript got delivered before time. Surely going to recommned my collegues about it. The mail transcripts team is really awesome.. they sent my Certificates from the IGNOU university in New Delhi to Toronto. They kept me updated regularly on the status of my request. Now I see it is received by the University of Toronto in their website. Thanks to Mailtranscripts team for getting the strenuous and boring job of getting transcripts done so quickly. I was not hoping the Rajasthan university part to get finish so quickly and I am surprised by how well they managed it. Strongly recommended. I got my transcripts very easily and I would reccomend stroungly to use their service...appreciate the work and idea of helping people on this front. Thank you so much! Amazing service with prompt response and updates.Thry made it possible to get my transcript from Bharthiyar University to US. My wishes to the entire team.Thank you guys! True to their commitment, the transcripts from Calcutta and Mumbai were processed and delivered before time. Very impressive service. Very Proffessional and quick service. I was unsure before using Mailtranscript services, but after using their services; I highly recommend it. Totally worth the money. They sent the transcript to WES within 3 days.....amazing service....thanks so much for saving me from all the hassle. I am extremely happy and satisfied. Such a huge help. Things done before time. Thank u so much. I'm glad I came across these folks. Hassle free, quick and convenient service. Definitely recommend them! Awesome service. Whatever was promised was delivered. quick and reliable, thanks for helping me and my wife. I think many people don't know about this site since until we really type mailtranscript.com, this doesn't come. More advertisement is required because this is a brilliant place for everyone. Going to college and to collect transcript is a pain and from outside country, it's really difficult. I am so impressed with this that I can write testimonials wherever possible. Thank you! You guys are awesome ! Very smooth process, completed in half the time that they have initially promised. Highly recommended. Awesome and unique service.. Really great. It saves your time . You do not need to take any pains. They will take pains of getting the transcript on your behalf. Its relaiable and trust worthy.. I am very excited to write this review as I was facing many issues to get my transcript done from India but with Mail transcripts its was easy. I will surely recommend all others I know to avail their services. MailTranscripts is amazing - they did a great job for getting my transcripts - I really recommend them to anyone who is in need for transcripts. As the name suggests,I found, Mailtranscripts as a quick and reliable service for getting attested transcripts from Mumbai University to overseas.Thanks and Keep it up MailTranscripts! Outstanding service by the entire team of Mail Transcripts, I am really pleased with the support and service and also constant follow-up emails from them. I have received my engineering transcripts and it was faster than expected. I also received an email today that my transcripts for the Diploma is also ready and it was 11 days earlier than the ETA mentioned by the support Team.I would definitely recommend this service to anyone who wants to get the transcripts done whether they are working in India or any other country and do not have time to visit the university in-order to get the things done. I really appreciate the hard work done by the entire team. I would definitely given a 5 star rating if there was a option to do so. Thanks a lot for the entire team working in Mail Transcripts. Very reliable, trustworthy organisation to handle the job of obtaining transcripts from the university and institutes. They are quick as well and complete the job within the given timelines.. Great job guys. Highly recommended. Awesome Awesome...u guys are awesome.... Reliable,honest and Trust worthy. Mail transcripts is fastest mode especially for those sitting abroad and have no mode to reach to Mumbai University I recommend Mailtranscripts and NOT agents to get transcripta. Amazing, the service offered by Mail Transcripts was beyond the expectation. I never thought that by siting in Colombo I could get the transcripts from Mumbai University...this is made possible and that too within 5 -6 days. Absolutely fantastic service. Delivered way before time. Excellent support. Highly recommended. Genuine, responsive, pro-active. They got my transcripts at lightening speed. I would surely have taken way longer had I been in Mumbai myself. Anything with regards to Mumbai University, they are the go-to team. Keep Rocking MailTranscripts!!! MailTranscripts team did a great job with timely delivery of my transcripts.. Thank you so much for all the help. They are fast and they get the job done. Once i submitted the details and made the payment i did not have to do anything. Their site will keep an up to date track of the status of your request. Totally recommended. Thank you mail transcripts for an excellent job inprocuring my degree transcripts.Sitting here in Riyadh,I was desperately wondering as to how I would procure my degree transcripts from Lucknow University.Thanks to my daughter Sunayna who found out your site on the net and directed me to you.To all those in a dilemma as to how to procure their transcripts from India,I will always recommend your services. MailTranscripts was god-sent. I needed my transcripts from University of Mumbai and I needed them within a week. I contacted Shivam; he assured me that MailTranscripts would get the transcripts in a week’s time. I decided to trust him and on the fourth day after payment, the transcripts reached my home. Best part was I could track status of my request throughout the process. It provided a lot of relief to know that my order was being processed on schedule. Thanks, Shivam and thanks, MailTranscripts! And, best of luck! Highly recommend their services. They not only sent me the transcript before their given estimate but also sent me a free scanned copy of the transcripts, which helped me meet my deadline. Would definitely use them again. Great service and does solve an age old problem. Hope that it scales up and covers all Indian universities by next year. Very happy to see a start up success story. I Would like to thank, mailtranscripts for providing such a wonderfull, fantastic and speedy service. Wanted to get my Marksheets evaluated from WES, fortunately came across this site looking for a way to get my documents attested from Mumbai University. My querries were promptly responded. The status of the attestation and other details were promptly updated on thier website. It save me atleast a week. Thank you Mail Transcripts. You have earned my trust and i will surely recommend you to others. I requested my medical transcripts to be sent to canada as I had applied for a program. Not only did they process my order efficiently, but the university received the documents within a week. I would recommend them to anyone with confidence and appreciate their efforts and professionalism during the whole process. First of all it is a genuine online site which does help us with transcripts from universities. I got my transcripts done through them from mumbai university for WES Canada and I had to only provide them with scan copies of my certificates. Thats it. Thank you team for the dedicated team effort and for hassle free availability of transcripts. Getting the transcripts from Mumbai university is a great pain but thanks to Mail Transcripts, i was able to get the transcripts in no time. Moreover they keep themselves well versed with the requirements of different visa agencies or education verification organizations so getting the stuff done with proper information is what you get from these awesome people. The best part that every thing is done legally. Thank you !!!!!!! College transcripts and university attestations can be absolute pain with myriad rules and forms and places to visit. It's a veritable nightmare ... More so if you don't reside in India anymore. I started my Canada migration process over a year ago and got stuck with the wes requirements. Strangely for almost six months I couldn't find a single agent or agency who could help me with attestations or transcripts. All recommended either getting a friend's help or go at it on my own. I was almost ready to give up on my Canada dreams. As a last attempt I scoured through thousands of blog posts, forum threads and post comments. Finally I chanced upon "mail transcripts" in a person's response to some comment at the bottom of a really old post on migration. There wasn't much about the service except the name. This moment I call "finding the golden needle in a haystack" moment. Post that all it took was a month and a half to get hold of the required documents. Shivam from 'Mail Transcripts' was super efficient and helpful in every possible way. He answered all my queries within a day's time. And the cost .... Surprisingly affordable. I can't think of a better example for exemplary customer service. The team at 'mail transcripts' figured the problem area and have come up with an amazing, quality service. I'm thoroughly impressed by their efficiency, knowledge about the domain and super fast response time. Thank you once again shivam for all your help on this. Your team's fabulous. I wish you success and it goes without saying ... I will always recommend you to all my contacts for attestations and documentation work. You guys are doing a terrific job. MailTranscripts team did a great job with timely delivery of my transcripts. Initially when I checked their website my college was not in the list. I contacted them asking if they can get me transcrips from my college. They responded timely with all the details and added my college to the list. Entire process was smooth. I'll highly recommend their services. I am glad that I chose them. I moved to the US a year ago, decided to continue my study further as I work. Problem - i needed to submit official transcripts of my previous education. I started looking around in the internet for agencies that help with international transcripts delivery. Came across WES but was not sure due to poor reviews. That is when i came across a post in Quora about a startup named MailTranscripts focused on helping people like me who cannot personally collect the transcripts from their colleges. They took care of everything and they were much more cost effective than other alternatives. I got my transcripts in over a month. I thank MailTranscripts for their excellent service and hope they continue doing the good work. Hello - thank you very much for the speedy processing and delivery of the transcripts (5 days ahead of delivery!!). I'm very impressed and cannot express how easy you have made my life with getting the transcripts done so swiftly. You have a great business concept with very helpful cause for people living abroad. All the best !